Week| 30, I can't believe it! Total Weight Gain| Luckily when I went to my doctors appointment on Monday I'd put on a little less then 2 pounds since my last one, it still puts me up over 30+ at this point! Symptoms| Still going strong with the ones from before, occasional back aches and the what not. The only knew one I've noticed more recently is depending on my position, like if I'm not sitting in a good chair I really have a hard time breathing. I found out at my appointment this week it's her head going up into my lungs! Usually 80% of babies are head down by this point, my baby not so much. Luckily she still has time to turn over. But with her being head up it's less flexible then feet and will cause a harder time breathing when it gets pressed into your ribs/lungs. Cravings| The only thing I'd say I really have a craving for is ice cream, and unfortunately french fries. Luckily I've only caved into the fries a few times. I used to drive past fast food and the smell would make me nauseous, now it just makes me hungry for fries! Sleep| I'm kinda settling into the routine of some insomnia between about 3 - 6 am every few nights or so. It's been terrible hot lately upstairs in our bedroom, so more often then not I either move downstairs to our guest room or just start there to begin with. The worst part is I feel so much better and more awake during my early morning bouts of sleeplessness then I do when I actually end up getting up for the day, by then I'm just plain tired and groggy! 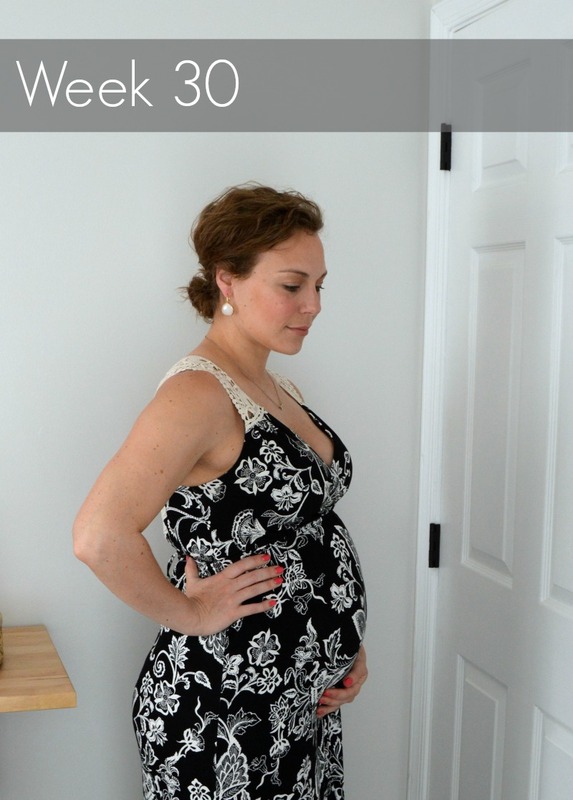 Clothes| All maternity pretty much all the time! I kind of feel at the point where it doesn't make much sense to invest in much more, so hopefully I can make what I have last through the summer! But I'm definitely getting some use out of my maxi dresses with this warm weather. Workouts| I slacked on this BIG time last week. Mainly due to my sleep schedule, with being up for a few hours in the middle of the night I end up rolling out of bed later then planned and then end up taking it easy instead of getting my but out for a walk. I've also just been more tired lately, and work has been wearing me out more and more. Thank goodness I'm active there! Nursery| Finally feeling like it's a real room. I shared all of the furniture that we have in place earlier this week, and now I'm excited to start to get working on the details. The foam just came in yesterday so I plan on getting started on the window seat this weekend. I also need to start organizing all her little things and washing the things we will be needing in the beginning. Movement| I'm feeling more and more, but definitely different as she's getting bigger. Due to her position I feel a lot of little thuds and kicks down low, including the occasional bladder ninja kick. Overall though I have to say her demeanor is pretty gentle, there never seems to be anything crazy. I know people have said they've seen a hand or a food poke out and I've never noticed anything close, just a roll and a flutter here and there. Best Moment this Week| Our 30 week ultrasound, it was truly amazing! I had no idea the amount of detail we'd be able to see. You could see her face pretty clearly, and her cheeks which are already a little chubby. We could tell that she has hair already, it was so cool! She's measuring right on track. Right now she was 3.5 lbs and they are estimating she'll be in the 7's at term, so we'll have to see! Missing| A cocktail! I've never been a big drinker, but seeing everyone else enjoy one this summer is making me a little jealous! Looking Forward To| Getting some more work done on the nursery, I love seeing it all come together and makes me excited to be getting it all ready for her!